I trust this note finds you well, and I must say that your latest missive hurts me deeply. How hath Roselyn poisoned your ear? That I know another on the trail of war? Impossible and never, my love. Where or when should a soldier know a woman in the trenches of our nation's filth? Among these Massachusetts men? Quite laughable. Betwixt our Pennsylvania brothers? Ne'er shall I bathe in their presence, my darling. By my troth: know that you, my heart and eyes and ears and tongue, are all my sense. I see and taste and smell you every day, though you absent, my stars and sun. Here'st I wake, under you my sun, and here'st I slumber, 'neath you my moon. These months have been hard, indeed, but please read my words and feel buoyed that I am also afloat 'mongst our foresworn love. This Monday past hath been a bloodbath of sorts, but not without a fight. 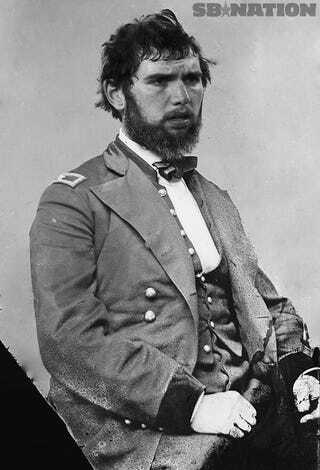 I led as far and hard as one could, but alas, those nasties from below took us in the end. Whatever was I to do? Call flank with worser speed? Counter-attack with lesser men? How does one sacrifice his own to the wolves of superior luck fortunes? I'll mention—with no editorial whatsoever—that Lt. Richardson performed well early on, but exhaustion's rapacity soon took him. Poor man. Hospital now prognosticates multiple amputations. We'll find a good man, I hope. Oh well. On the bright side, our counters were as strong as they could have been. The men fought hard, but to little effect. I scream and scream, yes, but still they won't assent. Is it my age? Perhaps a weak voice? Do I look a buffoon? These are questions for the pitch black bunk. I love you, my dearest. Please tell Mother and Father the same, though I hope by now the consumption has taken them both, for both their own sakes. Andrew Luck is Amish. He is a Civil War General. He is a star in the Hobbit.